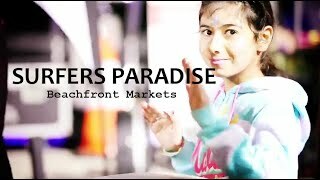 The iconic Surfers Paradise Beachfront Markets have been adorning the foreshore of the popular tourist precinct since 1995, catering year-round to holiday-makers and locals alike. Each Wednesday, Friday and Sunday evening, discerning shoppers and experience-hunters make their way to the Surfers Paradise foreshore to wander along the coastal stretch of around 100 market stalls, with live entertainers setting a casual mood. One of the largest night markets on the Gold Coast, the Surfers Paradise Beachfront Markets feature a variety of premium products, including fashion, jewellery, accessories, artworks, photographs, beauty products and home wares. There's plenty of artisans-at-work and interesting attraction and entertainment stalls to keep the most seasoned people-watchers interested. If you're looking for an unusual gift or one-off piece, the Beachfront Markets are your one-stop-shop, with friendly stallholders always on hand to chat about the 'how', 'what' and 'why' of their wares. Make a night of it and head into Surfers Paradise for a Markets and Dinner Combo! Just across the road and down the Cavill Mall and beyond are dozens of restaurants and eateries to suit every taste, making visiting the night time Markets part of the total Surfers Paradise experience.